When my son started to sleep in his own bedroom and on his own bed, my major concern is to hope that he won’t fall from his bed. The kind of bed we haven’t had the railing installed as my husband keeps forgetting to install the wooden one it has. In order to prevent our son from falling while sleeping, we ensure to put extra pillows on the other edge of his bed. I’m glad it works, hence as a mother I still can’t sleep very well at night thinking that one of these days my son will accidentally just rolled over into that edge and fall. 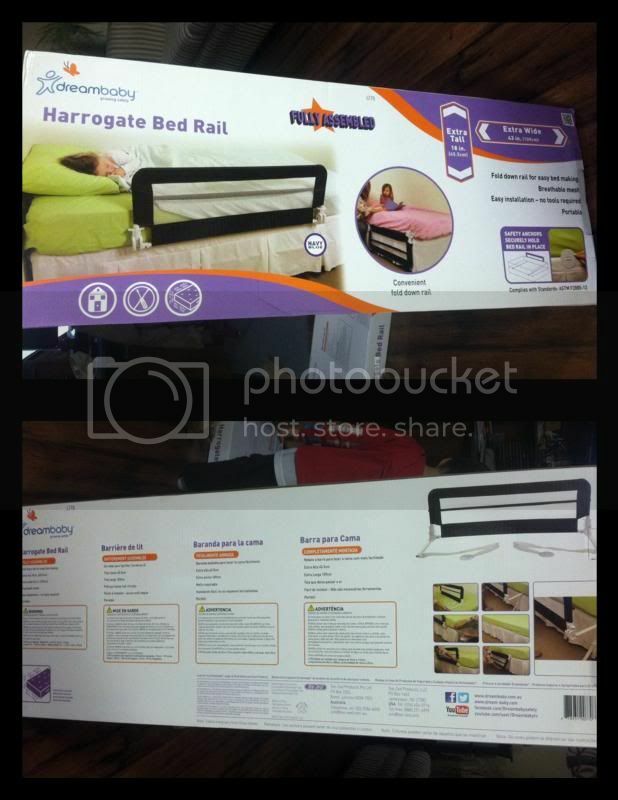 I’m so happy that Dreambaby has given me the chance to review one of their merchandise and it is the Harrogate Bed Rail. The minute I saw the item online at Dreambaby website, I was so happy that my prayers were finally answered. No parents would want their kids to be harmed, especially not during their sleep. When all we want is to give them a good night and unbothered sleep at night. I was very overwhelmed of the rapid shipment through FedEx, I always deem that expecting your merchandise speedy is what every customer wants. I received a 2 navy Blue Harrogate Bed Rail and fully assembled. A convenient fold down rail, an easy to install with extra tall of 18 in [45.5cm] and extra widths of 43 in [109cm]. It also has a very easy and quick fold down rail for an easy bed making. No tools required for installation and portable. It has a safety anchors that securely hold the bed rail in place, and also complies with standards: ASTM F2085-12. Parts listed are; Bed rail, brackets, tabs, straps and anchor plates. 1. Pull down Brackets until they click and lock into position. 2. Slide Brackets under mattress. 3. Position Bed Rail so there is a gap of at least 9in. [23.0cm] from both ends of the bed. 4. Slide Straps under the mattress and out the other side. 5. Tighten Straps so that 2 Anchor plates are tight and flat against the side of the mattress. The Bed Rail is indeed sturdy, secures the side of the bed so my son can sleep without slipping into the other side and without having any chance of falling from his bed. It holds or support firmly it won’t wobble and it stays still. Versatile as it does not need to be removed but instead fold it down when it is not needed. I’ve also noticed the material used is high quality. Now I can sleep well at night knowing that my son will be secure with the bed rails. Thanks to Dreambaby for making such an awesome one. You could get yours too for your precious children. We need to protect our kids even when they are sleeping. You can always get your Harrogate Bed Rail at http://www.dreambaby.com.au/ while you were there you may also check out the other merchandise they carry. To learn and hear more from them please follow their Facebook, Twitter, and YouTube pages. I will be hosting a Giveaway courtesy of #Dreambaby. Please check the rafflecopter here. A disclaimer: This is not a sponsored post. 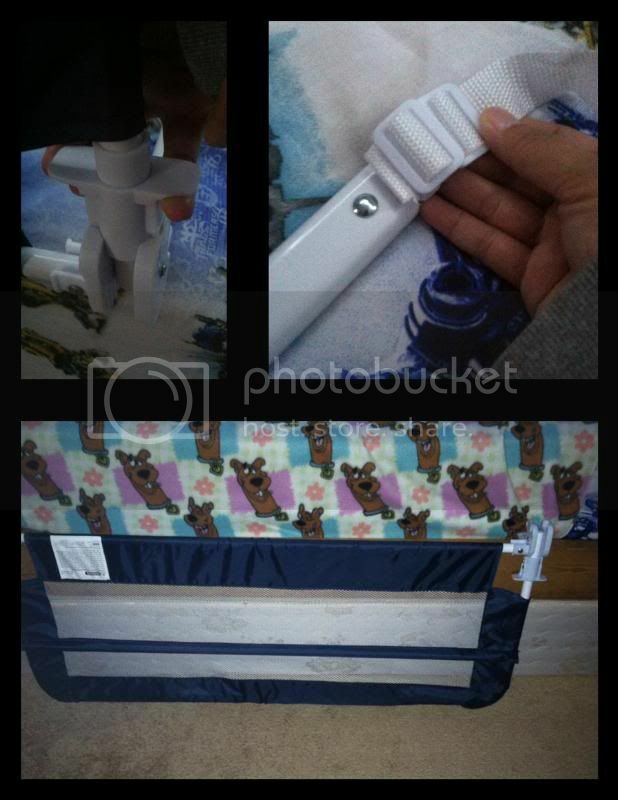 I received the Harrogate Bed Trail from Dreambaby for FREE in exchange of my honesty review. The outlook I expressed is 100% exclusively mine. we used bed rails for ours when they moved to a big kid bed.it sure helps them feel secure. That’s a cool bed rail. My niece sleeps in bed without frame because she moves from one direction to another. That rail will be great for her. I used to have one of these for my son when he was about 10 month old and would not sleep in his crib any longer. 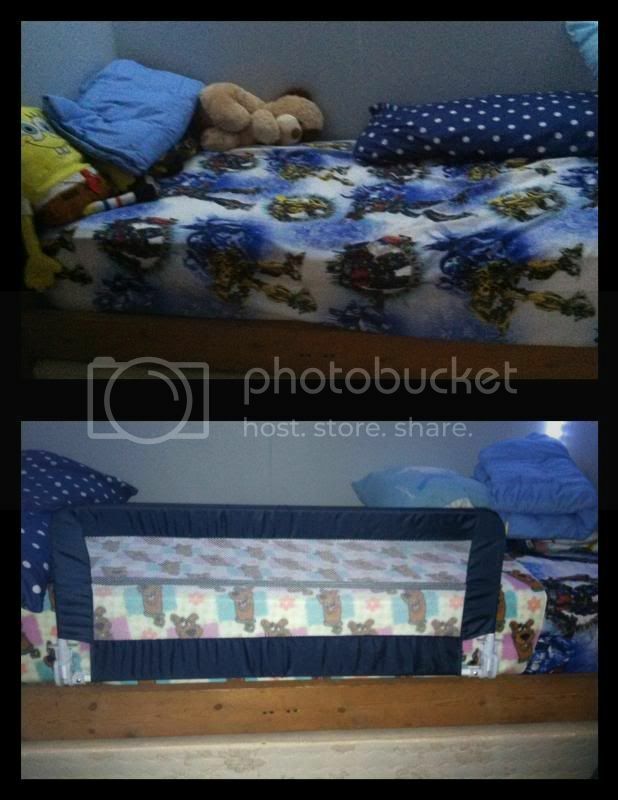 He hated it and I hated how much he tossed and turned at night, a bed rail like this is perfect for this type of situation or for transitioning your child! Love them! oh that's really convenient. My kids are quite big now so even though they sleep on bunkbeds, they are not so prone to falling, thanks for the review, other moms would surely find this helpful. I haven't seen anything like this before and I think it's a useful breakthrough esp for parents with young children. That is really nice to have when you have small tots. You got a gem in here. This bed rail is very apt for toddlers and young kids. Yung malilikot matulog are now safe. It's great that this is portable, perfect for traveling or visiting relatives for the Holidays! I am sure, it is scary to think our kid falling while sleeping in bed. I had the same sentiment with my daughter when she first sleep in her own bed, which is slightly higher than usual. We were just discussing this the other day and a friend of mine needs one for her daughter. I will share this with her. Helpful to you, as what this article meant to be. Really, it made for that purposes. Thanks for sharing. your kids must be feeling after this was installed. That would be a great help for those who has baby or toddler as it would refrain parents from worrying on accident that may occur while their young ones are sleeping alone on bed. That is a wonderful thing to protect you kid from falling off the bed. Like magic you can carry it around with you so everywhere you go you have peace of mind while little one sleeps! That's pretty nice! My boys don't have their own bed and room yet, and even if we are all still sleeping on the floor, they still sometimes fall out of the mattress. This would really be nice to get one when they get their own beds and room. This looks like a great product! We got lucky and didn't need these, but I love how easy this one is to use. That is awesome! I have been wanting two of these for my kids and I would check this one out. Thanks for sharing! I wish OI have one of these when my kids were little. Oh this would really fit on my darling daughter's bed. We are switching her to a big bed soon and we are looking for stuff like this that would keep her safe and protected. I just remembered m sister needs this, came back to share with her. This bed rail seems like a really good idea. it will allow a child to sleep on her own and help parents feel more at ease out thir little baby growing up. That's an awesome bed stuff. Bed rail is very essential especially for kids, mine sleep in her crib so I can't relate that much but for safeness, yes, I so agree! Thanks for sharing Momi Novah! I can still remember when my daughter fell on the bed one night and I heard the most pitiful cry. This could have prevented it. My kids still use a toddler bed and I sometimes worry about their safety too. I will check out this railing. I haven't seen a bed rail in the Philippines yet. It's a nice safety addition for the home. This looks like a durable bed rail. My niece needs one, and this sounds like a good one for her. Great product to help transition kids!